These retractable crowd control stanchions, also known as queue belt barriers, feature your custom designs printed in 1 colour on both sides of the belt. The hard-wearing woven nylon belt features a black colour that makes reading the logos easy. 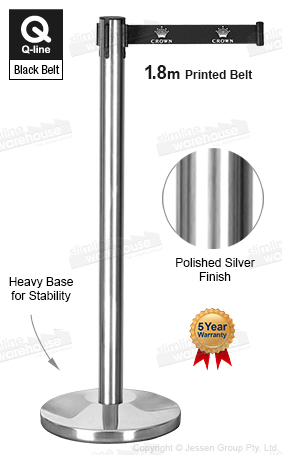 The stanchion pole itself is made of stainless steel and has a silver colour that complements the black belt for a professional look! 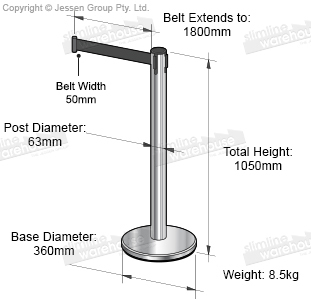 The retractable crowd control stanchions use a 1.8m long belt that makes connecting to other posts or wall clips easy. The post barricade systems have a 4-way adapter atop the post to make creating a queue & sectioning off areas easy in different directions. The base of the queue pole is rubberised to protect floors from scratches, and is stable during use thanks to being weighted. Setting up the stand is easy as well, with no tools required to attach the pole to the base! Click here to see the online catalogue which is full of items that you can confidently place in your location to help promote & sell merchandise! Slimline Warehouse has been a leading provider of high quality goods for over 20 years, & we offer same day despatch with most in stock products when purchased by 1pm EST to Sydney, Canberra, Adelaide, Perth, Melbourne, Brisbane, Hobart, & anywhere else in Australia!